Sometimes it takes a village. Sometimes a team of six will do just fine. They call themselves the Oyster Boys, and they want to save the Bay. 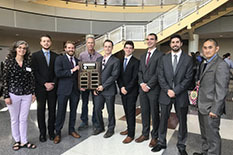 In May, University of Maryland Seniors Chris Buckley, Patrick O'Shea, Steve Powers, Noah Suttner, Noah Todd, and Kyle Thibeault won the Design Day Sustainability Award for a dredge detection device they built that uses sensors to detect illegal dredging and alerts authorities when thieves are stealing oysters. Design Day, which is the culmination of the Department of Mechanical Engineering's Integrated Product and Process Development Course, featured 33 teams of senior-level students who presented project prototypes built to solve selected engineering problems. Under the direction of Assistant Professor Mark Fuge, the Oyster Boys developed the dredge detection device over the course of the spring semester. "Our product is essentially an underwater microphone that detects the noise that the dredge makes when poachers are stealing oysters," says Kyle Thibeault. In an effort to mitigate theft in oyster sanctuaries and private oyster farms in the Chesapeake Bay, the team created a floating beacon that detects dredging using a hydrophone. "We actually 3D-printed the housing of our beacon," explains Thibeault. "The beacon sits about 10 feet above the Bay floor and has a pulley on the front of it that allows it to go up and down in the water. So once it hears a dredge, it releases itself to the top and then the atmospheric pressure sensor turns on a GPS locator that alerts authorities of its location." In researching the poaching problem, the team found that even though Maryland taxpayers invest $1.5 million annually in the restoration of oysters in designated sanctuaries, 80 percent of these sanctuaries are poached every year. Oysters are essential to the health of the Chesapeake Bay's ecosystem; they filter the water as they feed, helping to keep the bay clean for underwater grasses and other aquatic life. The team first tested the prototype in a swimming pool to see if it could pick up sounds underwater. "Then we made improvements and tested it in the Chesapeake Bay," says Noah Todd. "This gave us an understanding of the hydrophone's performance and the different sounds in the bay. So we were then able to isolate and identify the sounds of dredging." Implementing enhancements to the device and creating a more advanced prototype would be the next step, if the team decides to move forward with it. The University of Maryland's Office of Technology Commercialization is currently exploring the prototype's potential for real-world applications and deployment.